North Featherstone's Kyle Pearson, who scored two goals in their cup final against Ferrybridge Progressive. Ferrybridge Progressive celebrated clinching the Castleford Sunday League in midweek, but saw their hopes of a clean sweep of trophies dashed when they were beaten in the final of the Premier Division Cup. 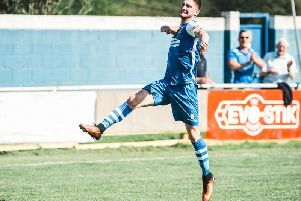 A 1-0 win over title rivals Fryston AFC last Wednesday earned Ferry the Premier Division championship, but it was a different story in Sunday’s cup final against North Featherstone played at Fryston. North Featherstone have had a disappointing campaign, but put that behind them to end their season on a high with a 2-0 victory. Ferry showed their intentions from the kick-off, but a good save from North Fev keeper Danny Glassell denied them in the first minute. Fev then settled and went ahead when Kyle Pearson’s shot went into the bottom corner of the net after good play from Gav Catton, Ian Jackson and Andy Burton. Ferry came back, but good defending from centre-backs Chris Appleyard and James Dunn denied them. On the half-hour mark the game was held up as Featherstone right-back Kieron O’Toole left the field with a suspected broken leg. After the delay Fev finished the half stronger and Pearson got his second right on the half-time whistle. In the second half Ferry pushed more people forward to get back in the game, but found Fev’s back four of Paul Bourke, Appleyard, Dunn and sub James Cave in fine form and when they got a look in on goal Glassell was there to deny them. Going the other way, Jackson saw a good chip over the advancing keeper come back off the post and man of the match Burton caused Ferry’s back line problems all game as North Featherstone ran out deserved winners and ended their season with some silverware. Both clubs and officials wish Kieron a speedy recovery and hope his injury is not as bad as feared. Ferrybridge were celebrating on Wednesday, however, as they got a win that ensured they finished top of the pile in the Premier Division to retain their title. They went into the game knowing a draw against second-placed Fryston would make them uncatchable at the top and were able to field a strong side despite all the games they have faced in a testing run-in. But they were made to fight for the title by opponents who defended stubbornly and showed why they have spent most weeks of the season in top spot. The game remained goalless in the opening half and looked to be possibly heading for a draw until Jamie Bird emerged as the hero for Ferry when he scored the winning goal 12 minutes from time. The result left Progressive five points clear at the top of the table with one game to go and Fryston, who have finished, certain to end second. Ferrybridge now take on Fryston again in the final of the Oakworth Open Cup this Sunday at Kellingley Welfare’s ground (kick-off 10.30am). Fryston earned their place with a 5-1 success away to AFC Pontefract Sports & Social last Sunday. Upton Wrangbrook lifted the First Division Cup when they beat Eggborough AFC 5-2 in a final played at Kellingley Welfare. The First Division fixture list is now complete with Railway Inn ending 13 points clear at the top with a record of 19 wins, two draws and just one defeat. AFC Royal Oak finished second on 46 points, one ahead of George & Dragon Pollington with Upton Wrangbrook in fourth ahead of Whitwood Metrostars on goal difference. Smawthorne FC picked up the wooden spoon after winning just three of their 22 league matches.